Asks us to believe the terrorists would, after slaughtering countless people, risk their entire plan—and their very lives—on...well, I won't say. But from my vantage point, it was ridiculous. 90 min. Columbia Pictures. Cast: Dennis Quaid, Forest Whitaker, Sigourney Weaver, Matthew Fox, Edgar Ramirez, William Hurt. There's a point in Vantage Point where it bends to breaking the P.O.V. pattern established and repeated over the course of the film. We've (re)experienced a terrorist event from the perspectives of a cable network news honcho (Sigourney Weaver), a Secret Service agent with something to prove (Dennis Quaid, in the In the Line of Fire role) , a Spanish cop (Eduardo Noriega), Forest Whitaker's tourist with a Sony Handycam (thanks, corporate parent! ), and William Hurt's U.S. President, but once we get to "the terrorists," the conceit starts to come apart. Is it a matter of narrative expedience, screenwriting laziness, or the dehumanization of the enemy that allows the final reel to slip out of the sprockets and go rogue? Why choose just one? This film from first-time feature director Pete Travis and first-time screenwriter Barry Levy comes across as a failed cinematic attempt to reclaim the action genre from the hit TV series 24. At the outset of a landmark counter-terrorism summit in Salamanca, Spain, a Presidential assassination attempt and bombing set off a sprint to locate the perpetrators and save the President's life. In theory, we'll continue to see the crucial twenty-three minutes replayed from different points of view. 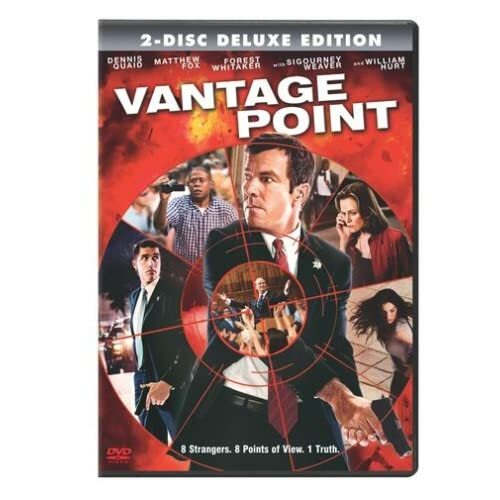 For a while, Vantage Point demonstrates a capacity to set the pulse racing, and moves quickly enough to keep us guessing. Travis gets considerable oomph out of the chaos of the terrorist event, and ably handles the foot and car chases, implausible as they may be. And the acting is mostly solid, with the glaring exception of Whitaker, who seems to have taken his Best Actor Oscar as free reign to squinch up his face into a mess of emotional signals. Most damagingly, the script is predicated on crazy logic. After taking a bullet for the President, apparently good guy Quaid gets little support from his colleagues; excepting Matthew Fox's character, Quaid's character is surrounded by jackasses who, instead of patting him on the back, expect him to fall down on the job. Whitaker's character, a father away from his kids, quickly and rather creepily bonds over ice cream with a little Spanish girl, a plot point that goes nowhere good. Once the truth begins to out, Vantage Point gets increasingly wearing, leading at last to a laughably unsatisfying climax that first presents a surprise terrorist with no apparent motivation, and then asks us to believe the terrorists would, after slaughtering countless people, risk their entire plan—and their very lives—on...well, I won't say. But from my vantage point, it was ridiculous. Sony's Blu-Ray of Vantage Point delivers an impeccable audio-visual transfer that gives the film every opportunity to shine. As it should, the film looks spotlessly clean, and there are plenty of immersive sound effects to keep the Dolby True HD 5.1 soundtrack working overtime. Blu-Ray also offers an exclusive: the "Vantage Viewer: GPS Tracker" that allows the viewer, while watching the film, to follow each character's location throughout the film; at various times, another character's vantage point will pop up in an embedded window below the film--oddly, this window's audio supercedes that of the film, with no on-the-fly capability to switch back to the feature. Still the color-coded GPS is pretty nifty, and arguably more useful than the similarly cool feature on the Cloverfield Blu-Ray. Director Pete Travis contributes a commentary track—at first, he seems to be telling us only the very obvious about the film's approach, but soon enough he hits his stride and gives some useful observations about what he intended to convey and what effects he hoped to achieve through camera placement and by his chosen shooting strategy. "Vantage Point: An Inside Perspective" (26:43, HD) sort of explains how the film came together, then works its way through its cast and covers the challenges of location shooting in Mexico City. Going on record are Travis, executive producer Callum Greene, screenwriter Barry L. Levy, Dennis Quaid, Forest Whitaker, Matthew Fox, William Hurt, Sigourney Weaver, Edgar Ramirez, Eduardo Noriega, Ayelet Zurer, editor Stuart Baird, and composer Atli Örvarsson. "Plotting an Assassination" (15:58, HD) gives further attention to the construction of the narrative and the thematic interest in assassinations, culling from the same bank of interview participants. 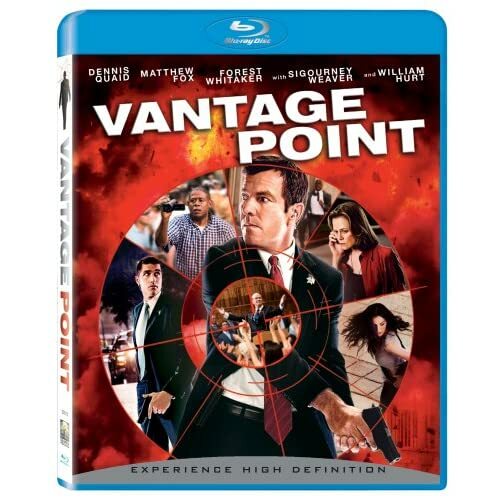 "Vantage Point: Coordinating Chaos" (7:27) focuses on the film's stunt sequences, adding to the mix the comments of stunt coordinator Spiro Razatos and producer Neal H. Moritz. "Surveillance Tapes" (:42) is a cute little outtake. As is the custom now, Sony also provides a BD Live function to take you to internet content, as well as previews for 21, Persepolis, Prom Night, The Other Boleyn Girl, Made of Honor, Across the Universe, and Steep. All site content © 2000-2019 Peter Canavese. Page generated at 04/19/2019 07:36:48AM.